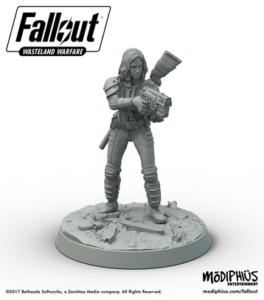 In this development blog about Fallout: Wasteland Warfare game from Modiphius, we shall look at Armour and Leaders (which were mentioned in the previous development blog post). In the world of Fallout, there are many dangers and few, if any, can be ignored even by the hardiest of wasteland travellers. Wearing lots of armour may make you resist damage better but, given enough time, being outnumbered, and/or a lucky strike, means even small threats can prove dangerous, if not deadly. In addition, the range of armour levels in Fallout is very wide with the simplest Raider armour at one end of the scale and the incredibly tough power armours at the other. This variety in Fallout was an interesting design challenge as the usual mechanics for armour were not suitable; for example, if a model’s armour rating purely blocked damage equal to its armour value then high armour values would be immune to some of the weaker weapons, whilst weaker armour would be almost irrelevant against powerful weapons. The goal had to be that better armour was more protective but still sometimes fallible, and enough hits would usually wear a target down. In Fallout: Wasteland Warfare, armour ratings range between 1 and 4. When an attack causes damage, the player rolls the Armour dice which is a d12 showing results of 1, 2, 3 and 4. (Like the Effect dice described in one of the previous development blogs, a d12 is used as it gives more granularity in its results compared to a d6.) Like Skill rolls, a player wants to roll equal to or lower than the number required. For Armour rolls, if the Armour roll is equal to or below the armour rating, the number rolled is the amount of damage blocked; otherwise, no damage is blocked. This means high armour ratings are more likely to block some damage (and an armour rating of 4 always blocks at least one), but still have have moments when they block a lower amount, or maybe none at all. For example, a Super Mutant with an armour rating of 3 which rolls a 2 on their armour dice would block 2 damage; however, if they had rolled 4, it would have blocked no damage. Models have an armour rating for each type of damage – physical, energy and radiation – so some are more susceptible to specific types of damage than others. Power armour is much tougher than regular armour so its armour rating is followed ‘+1’ by which means it blocks 1 damage in addition to whatever was blocked by the armour roll (even if that was zero). It may not sound like much but Power Armour is tough – just as it should be. Any target with a high armour rating is often best tackled with attacks that are likely to include armour reduction icons, as each icon reduces the target’s armour rating by 1 (just for that specific roll) . As is common throughout Fallout: Wasteland Warfare, you need the right tool for the right job and a weapon that adds armour reduction dice is usually more useful against an armoured target than a weapon that adds damage dice because armour reduction can make the target completely fail their armour roll. Units can be equipped with different weapons, gear and (as we saw in the previous development blog) some can be Heroic too; however, a player also has a further opportunity to give their force a bit of extra flavour via their Leader. Each player can make one single model their Leader by allocating a Leader card to it which gives some extra abilities. A player can choose what sort of Leader they want for their force – maybe they are a Hunter who is skilled at long-range shooting and improves the searching abilities of their team, or maybe they specialise in hacking, or brawling. 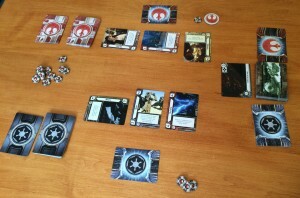 Some Leader cards will only be useable by specific factions too. In Fallout: Wasteland Warfare, some abilities affect any friendly model which is close-by (with the distance determined by the model’s Presence) – these are referred to as ‘Aura’ abilities. Many Leader abilities are aura abilities so the position of the Leader and those it leads is important, and a Leader can influence a side rather than just be a single model with extra abilities. Also, Leaders can add extra diversity for players both using the same faction. Remember, if you’re interested in receiving news on the game, sign-up for the official updates from Modiphius. 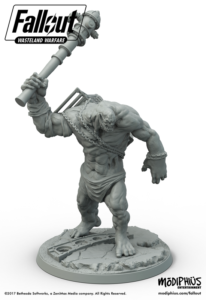 Plus, you can visit the Modiphius site to check out all the great-looking models and their status. Please note that due to the amount of spam comments bots try and post, all comments have to be manually approved so there can be a time delay to your post becoming visible. It’s often quicker to post on the Modiphius Fallout Forum or Fallout: Wasteland Warfare page on BoardGameGeek.com where I or someone else can answer your questions. 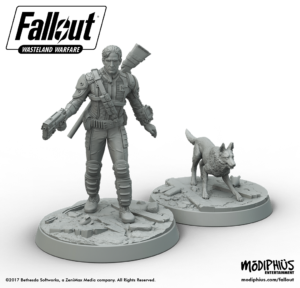 In this development blog about Fallout: Wasteland Warfare game from Modiphius, we’re looking at how some characters and creatures have an edge over the rest – they have that little bit of luck, or manage that extra burst of action just when it’s needed. In Fallout: Wasteland Warfare, these are called Heroic units. Any unit can be made Heroic, although they cost more to put on the battlefield – to make them Heroic, a Heroic card is placed above their Unit card and this shows all the extra abilities it gives models in that unit. So, what does a Heroic unit bring to the fight, you ask? We will get to that but, first, it’s important to take a look at the Action Point system. In Fallout 4, the player has Action Points (APs) which can be used primarily to move further and to use the V.A.T.S system so they can target and attack more times than they would compared to doing so in real-time – Fallout: Wasteland Warfare uses them for the same effects. Any model may earn APs – they are not too common, but Heroic models have a much better chance of gaining APs when they are activated. The most common way to earn an AP is via the Skill dice, as several results on the Skill dice give an AP; however, being equipped with some chems, equipment and perks can give some APs too. Each AP can potentially be spent to give a model a Quick Action – which are just like regular actions such as Move, Shoot, Lockpick, etc. – but each at a small penalty. Which activities a model can spend APs on is dictated by the Action Point Use icons on their cards and each icon can only be bought once per activation which gives some limits. Most models can only spend an AP to Prepare (shown by having the corresponding Action Point Use icon on their unit cards), but some units have access to more, such as Mutant Hounds who also have an Action Point Use icon on their unit cards for Movement. Yes, the Mutant Hounds are frighteningly fast, but some can really catch you off guard with that occasional burst. With that in mind, let’s return to the Heroic card and look at two of the abilities it conveys. The first ability is V.A.T.S. – when activating a Heroic model, the player rolls a Special effect dice which may give them up to 2 APs. The second ability is that the Heroic card shows Action Point Use icons for Movement, Attack and Expertise (which includes lockpicking, computer hacking, etc.). Therefore, a Heroic model is much more likely to have APs to spend plus gets a wide array of options to spend them on too (within limits). The abilities from the Heroic card don’t end there either as it also gives Heroic models access to Luck and Criticals. First, let’s look at Criticals which are powerful attacks. Each time a weapon hits an enemy, a Critical Point (CP) is added to its weapon card. When there are enough tokens (depending on the weapon), the weapon can use its critical effect. Just like Fallout 4, criticals always hit (so long as the shot is possible) and most add extra base damage, extra effect dice, and/or some have special effects too. Several results on the Skill dice also give a bonus CP too. If a model does not have the critical icon, they do not use Criticals or gain CPs. Players only have to decide whether to use a Luck token after seeing the outcome of an event – so there’s no need to spend one only to find out you didn’t need to, as that’s just annoying for players. Why adjust a roll by 2 and not a re-roll? There are several reasons for this – re-rolls are very powerful which is too swingy – if a dice was a solid success (i.e. needed to get 9 or under and rolled a 3) then it shouldn’t get totally overturned. Also, it’s annoying for players who have just done well to have it scrapped – this is especially the case when you’re facing a powerful model and, for once, they miss – if a player can just re-roll, then they become very hard to defeat until their ‘luck shield’ is down. However, luck is not guaranteed – it is luck after all. When you want to use Luck, you take one of the tokens and flip it – if it lands Luck-side up then it takes effect, but there’s no effect if it lands Luck-side down. (Players that prefer rolling, rather than flipping, can use one of the effect dice, or they can flip a coin – anything that’s 50:50). We’ll also have a sets of special Vault Tec approved Luck dice. Note that some units in Fallout: Wasteland Warfare have some of the abilities on the Heroic card – there are Units which have a Luck icon on their cards without needing to be Heroic, some equipment gives APs or Action Point Use icons, etc. However, a Heroic unit gets all of the above – they just cost more caps (points) when creating your team. There are more ways to customise your team too – one model on each side can have a Leader card which gives other abilities, and we’re trying out similar cards that give creatures extra abilities too, so you can have a Glowing Radscorpion or a LegendaryDeathclaw to change up the power levels. More on those in later posts! In this development blog about Fallout: Wasteland Warfare game from Modiphius, we’re looking at the Effect dice that often accompany a Skill roll. Whenever a skill roll is made, like shooting or lockpicking, you roll the d20 Skill dice to see if it is a success; however, depending on the equipment, abilities, perks, mods, etc. being used, you might also roll some Effect dice as part of the skill roll too. There are four different Effect dice in Fallout: Wasteland Warfare – Damage, Accuracy, Armour Reduction, and Special – each is a different colour and these are d12s. Why d12s? Well, six sides on a dice just didn’t give enough granularity and/or variety to the outcomes for them to accomplish what was required, and twelve sides gives lots of different possible probabilities (plus, d12s are nice and big with large faces for icons too). When you make a roll, you grab the Skill dice and the relevant Effect dice which are easy to recognise as each dice type is a different colour, and coloured icons for each dice are shown on the card of each weapon, equipment, mod, etc. Your weapon shows two black dice? Just grab two black dice and the skill dice. As with the measurement sticks, the dice icons have markers which allow players with colour-blindness to recognise what they need too. Let’s go into a bit more detail about the different types by looking at them in relation to combat. Unsurprisingly, the Damage dice primarily causes extra damage – note that this is extra damage as each weapon deals a guaranteed amount of damage (called it’s base damage) and any extra damage from the Effect dice (one for each damage icon rolled) is on top of the base damage. This means the damage caused by weapons has a level of reliability, rather than be at the full mercy of the dice and see your missile launcher hit but only scratch the target when you roll a 1. The Accuracy dice primarily improve your chances of the Skill dice being a success. Many sides of the Accuracy dice have a number which improve the Skill dice. If your skill roll needs to be 3 or less then you would succeed if your Skill dice was a 5 and you rolled -2 on an Accuracy dice as that would bring it down to 3 which is a success – you just combine what you see. The Armour Reduction dice, as you may expect, primarily reduces a target’s armour rating – one for each icon rolled. We’ll discuss how armour works in a blog post soon, but suffice to say that the Armour Reduction icons can strip away a target’s armour, potentially allowing more damage to get through – pretty important when up against opponents in power armour. The final Effect dice is the Special dice. This is a generic dice that covers anything the first three do not. It shows three different icons with the one icon having a high chance, another a medium chance, and another a low chance of success. When a roll requires these icons, the cards say what the icons are required and what they can be used for. For example, does the Laser Rifle set fire to the target? Did the Huge Club stun the enemy? and so on. This allows Fallout: Wasteland Warfare to have Effect dice for any purpose. Of course, only expecting the best in the Wasteland will likely get you killed and the Effect dice are no different. There are no ‘bad’ results on any Effect dice, but some sides are blank so will have no effect at all. Also, note how I said the dice ‘primarily’ do something? That’s because Effect dice have the occasional result that are not the dice’s primary purpose; for example, it is possible to get an Armour Reduction icon on a Damage dice, although it’s rare and most results do extra damage. The icons tell the story of what happened too – rather than just doing damage, you’ll know if an attack just felled the Super Mutant was because of the heavy damage or because the shot managed to find a way past its armour. The Effect dice required for a weapon often vary depending on the range at which the weapon is being used. For example, the Hunting Rifle gives one Armour Reduction dice at short range, but at long range it gives two Accuracy dice instead. The Combat Shotgun gives no Effect dice at long range, but gives a frightening two black dice at short range. Simply seeing a weapon’s Effect dice makes it easy to understand its likely capabilities – a weapon with multiple black dice on its card means it has the potential to do lots of damage. Also, the Effect dice on a weapon card may not be the only Effect dice you add to a skill roll too. Items such as Mod cards (which are modifications to weapons), special abilities, perks, and so on, can add more dice (or simply add extra icons). More on those in a later blog post. The two-player starter set comes with 2 each of the four Effect Dice, one Skill dice and one Armour dice. The system and combination of Effect Dice gives us a huge variety of options to flavour the game to feel more like the Fallout world you know and love, whilst keeping the results of dice rolls quick and simple to read. 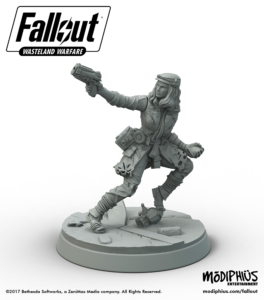 In this development blog about Fallout: Wasteland Warfare game from Modiphius, we’re talking about how the Fallout S.P.E.C.I.A.L. stats are integrated into the game. Every model has a set of skills which are represented by icons found next to each of the S.P.E.C.I.A.L. stats on their unit card. For a skill roll to succeed, the result rolled on the Skill dice must be equal to or lower than the value of the stat which the relevant icon is next to (after adding or subtracting any modifiers). If a model does not have a specific skill icon of their unit card, it can not make a skill roll of that type; for example, Brotherhood Field Scribes do not have a Heavy Weapons skill icon which means they can not make a skill roll to use Heavy Weapons. There are a few bonuses and penalties that can adjust the value of the skill that the player needs to roll equal to or less than, such as cover, using a ranged weapon in melee, as a result of using Luck; however, they’re quick and simple. For example, a Brotherhood of Steel Paladin receives a +1 bonus due to a Long Scope added to their rifle, but also a -2 penalty because the target is in cover; therefore, their rifle skill of 6 is adjusted to 5 and the Paladin needs to roll 5 or lower on the Skill dice to be successful. Before we go further: Why a d20 for the Skill dice? We chose this carefully so the S.P.E.C.I.A.L stats can be meaningful in gameplay. The S.P.E.C.I.A.L stats primarily range from 1 to 10. If a d10 was used for skills with these stats, a skill of 1 would be almost useless at 10% whilst a 10 would be too powerful at 100%. 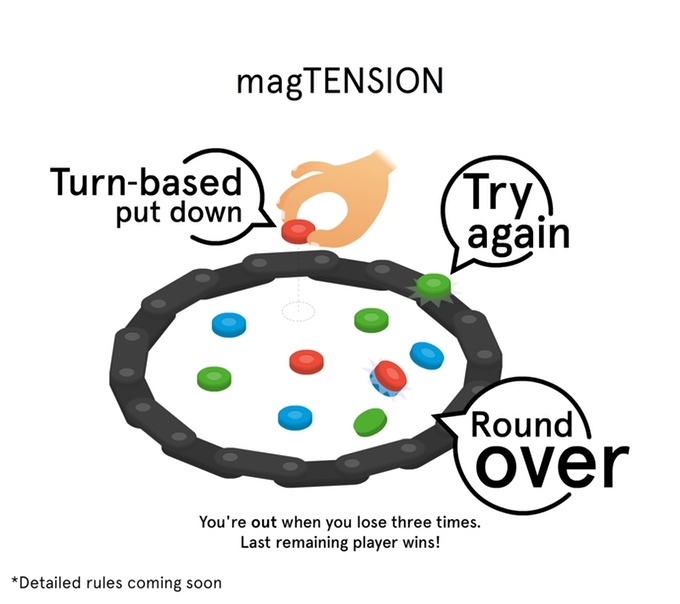 It would result in most units ending up with stats forced into a narrower middle range in order to make them fun to play and not be over-/under-powered and this would lose the unique differences that make them so cool. The d20 in Fallout: Wasteland Warfare allows us to have the range of 1-10 numbers but the number of available faces means we can have several 1s – so that a skill of 1 actually has a 25% chance of success – as well as some X results (which always fail) – so a skill of 10 will always have a maximum 85% chance. This system makes the full range of stat numbers useful, whilst each additional point in the stat still gives more chance of success. Also, the adjusted skill value can not go lower than 1 so a model with a relevant skill always has a chance. This is important as the world of Fallout has such massive variety that the steps in capability need to be subtle, whilst remaining relevant. We need to create a situation where lots of variety can exist without some units being so far superior to others that normal units become ineffective or even redundant. A person with a gun is still a threat even if untrained, and even power armour will eventually succumb to enough minor threats. Also, not every unit uses the same stat for the same skills. This allows us to create even more variety amongst units and bring out the unique traits of characters and factions. Piper doesn’t have the toughest physique but she is agile and that allows her to last in combat – a tough but not agile Super Mutant could last by taking the damage, whilst Piper’s Agility allows her to survive. As a result, Piper uses her Agility stat for her Health; whereas, more physically tough units use their Endurance stat for their health. Whilst Piper’s Agility serves her well for combat, her low Endurance means she is more susceptible to things like poison effects than the units whose Endurance is higher than hers. Field Scribes use their Intelligence when searching, whilst the Institute’s Gen 1 Synths use their Perception – both are good at searching but Field Scribes are more intelligent and Gen 1 Synths have better perception which is important for other purposes. 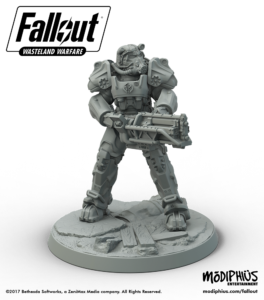 As a result, the units in Fallout: Wasteland Warfare have stats that better represent them on the tabletop, and this avoids situations where for example only units with high Endurance can take more wounds or only units with high Perception can be good at searching. And, it’s really easy to see which stat is required – you just see what number is next to the relevant icon. Next time, we’ll talk about the Effect dice that are used in conjunction with the Skill dice, and how one simple dice roll gives you the result of each action and describes what happened. Hi. 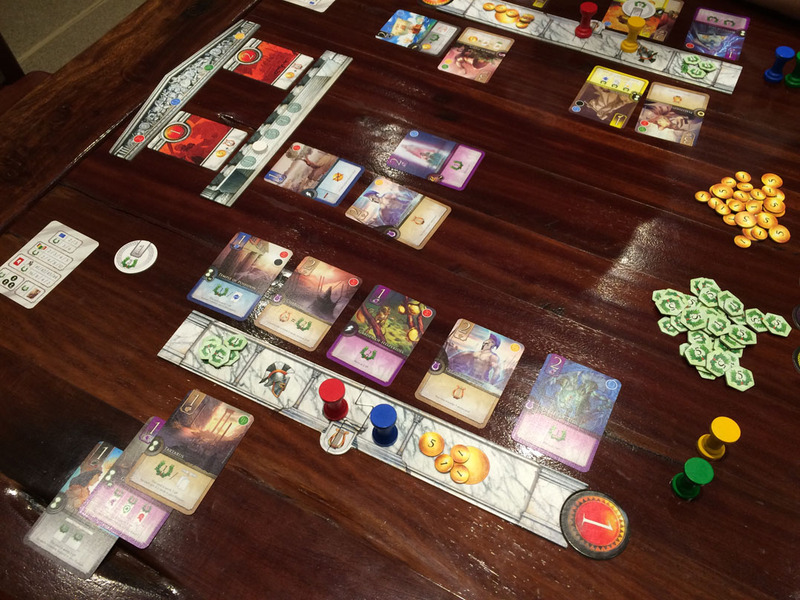 It’s been some time since I last posted on this blog with work and study taking up my time. Whilst I still won’t be able to review games for now, I’m excited to share my development blog for a great game I am working on. As some of you already know, I am Game Designer of the forthcoming Fallout: Wasteland Warfare game from Modiphius. Each week, I am writing a development blog on the game as we reveal the features of the game, and there is a lot to reveal! The first four blogs have been released already on the Modiphius site so I shall post these all here now. If you’re interested in receiving news on the game, sign-up for the official updates from Modiphius. Measurement of movement and ranges is one of the mechanics that we have taken a contemporary approach to in the same way that other tabletop games use manoeuvre templates and other devices. Each Fallout unit card includes the S.P.E.C.I.A.L stats for its unit giving us loads of great options for gameplay; however, we wanted to reduce the amount of numbers on the cards to simplify the information, so James hit on the concept of coloured ranges. The coloured ranges are used for all distances in Fallout: Wasteland Warfare, and the two-player starter set comes with a number of coloured range sticks of specific sizes. Measuring movement distances is simple as each unit card shows two colours – one for standard movement, and one for charging. For example, your Super Mutant unit card shows yellow for their standard movement which can be used for any movement; however, the unit card shows green for their charge which is longer than yellow. Each model gets two actions so you could move a Super Mutant in this unit yellow and then yellow again, or you could move them yellow, and if it’s now within green distance of an enemy, charge with your second action. The sticks show the maximum distance so you can move up to any point along that range stick, and it’s easy to use them to move around objects using marked increments on the sticks. Measuring weapon ranges is equally simple too. 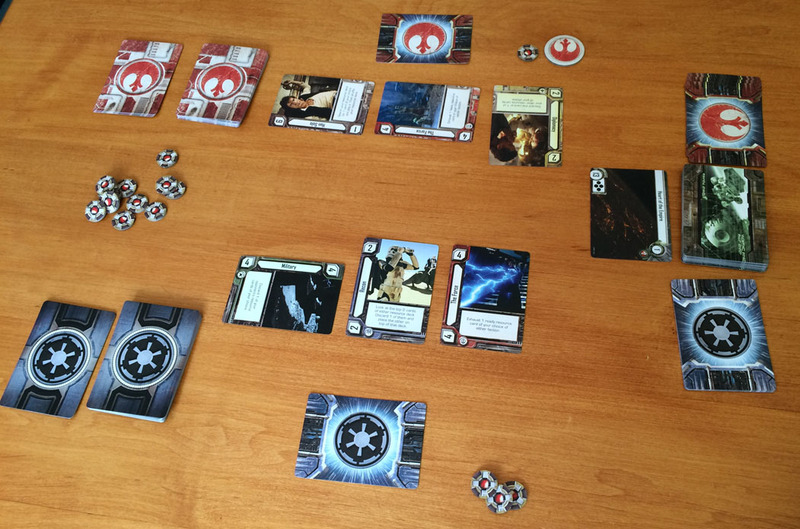 Attacks are all shown on small cards such as the combat shotgun or plasma rifle. Each weapon has a short range and a long range, and a coloured bar for each shows which stick is used. To measure a shot, you just grab the sticks shown, place them end-to-end, and you can immediately see the ranges. For example, your combat shotgun shows red for short range and blue for long – place the two end-to-end (red then blue) and you can see what falls within your combat shotgun’s blast. The effect dice rolled for each range are shown underneath the coloured range bands. So, for the combat shotgun, if your target is within the red stick (short range), you roll the effect dice shown under the red bar; if your target is within the blue stick (long range) then you roll the effect dice shown under the blue bar. The game will come with super-chunky, die-cut range sticks and we’ll also be producing Vault-Tec approved coloured acrylic upgrade sets. Symbols on the cards and sticks assist those with colour blindness identify the correct sticks. As well as movement and weapon ranges, colours are used for all other measurements in the game too such as awareness, presence, blast damage, set-up, determining falling damage, etc. This simple system speeds up gameplay and keeps the most important numbers on the unit cards clear and easy to read. 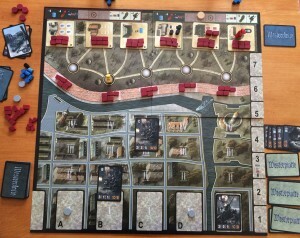 The players move around and defend the North of the board from the Germans who advance from the South. 7 Days of Westerplatte is a co-operative game about the opening shots of World War II, when a German ship began bombarding the Polish, with German troops soon following. 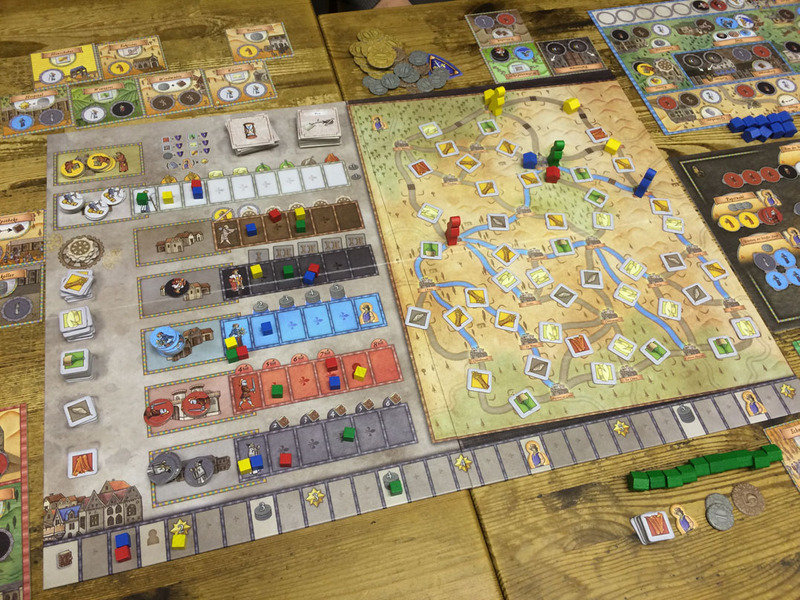 During the game, players take on the role of the Polish in trying to last out 7 days. The game is relatively simple. Players take turns carrying out their turn and, once a player has completed their actions, the German forces take their actions.